Enjoy your stay in our cozy and private self-contained apartment! The apartment is a comfortable, quiet and private space for guests. The space includes a bedroom, living/dining area, kitchen and bathroom (all for your use only). The location is very convenient with all amenities and several transit options within a short walk from our front door. We are not able to offer parking, but a temporary street permit can be obtained and there is ample street parking around our home for permit holders. I am a marketing and communications professional who has lived and worked in downtown Toronto for over 25 years. We have lived in the neighbourhood of Leslieville for over 18 years, in three different houses. We purchased this 100 year old house 13 years ago and have slowly renovated almost every part of it. The house has many original features and is full of character. Our basement suite is the most modern part of the house and is filled with mid-century modern furniture and art objects - collected over the years, one piece at a time. My design aesthetic is warm, enduring & classic. I love hosting for guests from around the world in our home, at our cottage and downtown condo. The basement suite is very welcoming and since we have a third floor family room in the house, our family spends most evenings there. So, the basement suite feels very private. My husband works on-site and is available for any questions, directions around town or if issues come up. This is a family home and we respect the privacy and comfort of our guests. We have managed rental properties for more than 18 years and are sensitive to the needs of our guests, too. This is one of the best neighbourhoods in the city, in our opinion, and the location is very accessible to getting around town - either by transit, by cab or on-foot. There is every kind of retail that you would need within walking distance at the top of the street - liquor store, beer store, grocery and a small urban mall called Gerrard Square with a Home Depot, Walmart, Staples and Winners. And there are also many great licensed restaurants on Gerrard Street that include sushi, Thai, Italian, Carribean and a Scottish pub named McGugan's for a beer on sports night. For more sophisticated dinning options take a 10 min walk down to Queen Street East and you'll find many, many other restaurants. 4 piece bathroom with glass door enclosure, 12 inch marble tile surround to the ceiling and glass mosaic insert. Pedestal sink and medicine cabinet storage. Stainless steel front bar fridge. Toaster oven. see toaster below. small low voltage oven for quick heating up or defrost. Extra large toaster oven that is big enough to cook a whole chicken. Japanese style tableware - place setting for 4. wine glasses, drinking glasses. coffee mugs. and cutlery. Galley style kitchen with butcher block counter and glass front, pine wood cabinets. Breakfast bar with vintage swivel stools. Glass top bistro table with two vintage style chairs and window seat. Loved the dog, family was very respectful and helpful if anything was needed! Leslie and Tim were wonderful people and excellent hosts, and their basement apartment was well furnished and comfortable. The location is in a charming residential neighborhood that is convenient to transportation and walking distance to Queen Street. We strongly recommend it! Cozy apartment in a great neighborhood! 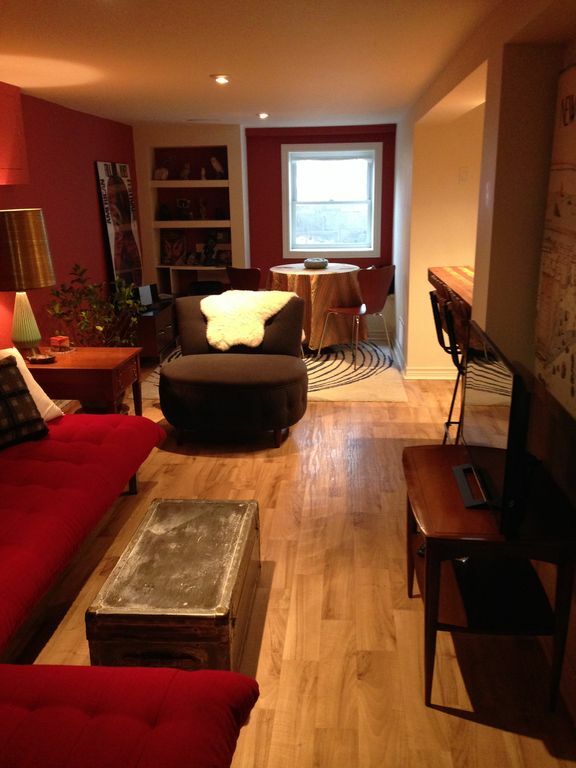 My husband and I stayed at this cozy apartment while we were in town for the Toronto Jazz Festival. The location is wonderful and in walking distance to great restaurants and coffee shops. Tim and Leslie were very helpful hosts. The apartment had everything we needed and was very comfortable and clean. We would definitely recommend it!! Although the apartment was in a great location for our needs, and we found it to be clean, regrettably it lacked in some areas. We would have appreciated coffee for our first morning there, cable-vision, and mirrors where they are needed (like the bathroom). We also found the stairs leading down to the apartment quite dangerous, being narrow and with no hand rail. Although the home-owners were friendly, we were quite disappointed in the apartment. Thank you for review! We are so glad you enjoyed your stay. To clarify, I believe you are saying we do not offer parking on site, which is true, however a temporary street permit can be obtained through the city of Toronto website and there is ample street parking around our home. 261 Boston Avenue. Major intersection Carlaw Ave. and Gerrard St.